People who love Disney believe that the animators and storytellers have the capacity to share big ideas and sophisticated concepts in a way that is manageable for young minds, yet applicable to the adults who often accompany them. I grew up on old-school Disney films. When Pixar emerged, its technology just didn't have that same nostalgic pull for me as the Disney cartoons of earlier times did. In full disclosure, I have never seen Up. This scene is it, but if the movie is anything like this clip, it seems like Pixar hit a home run. Carl and Ellie didn't have much, but they had each other. They had dreams and they made plans. And when they little choice, and when they needed to, they made new plans. They faced an uncertain future with love, patience, tenderness, and a sense of humor. Through it all, they had each other. Instead of dealing with life's pain and disappointment by pulling back (as is so easy to do when there's pain) they turned inward toward each other, supporting each other and loving each other...until the end...and even then. It seems that, regardless of the speed bumps along the way, they moved forward with plan b, plan c, plan d, and whatever other plans they needed in order to see their dreams through. Based on this clip, it seems like Pixar got it right. 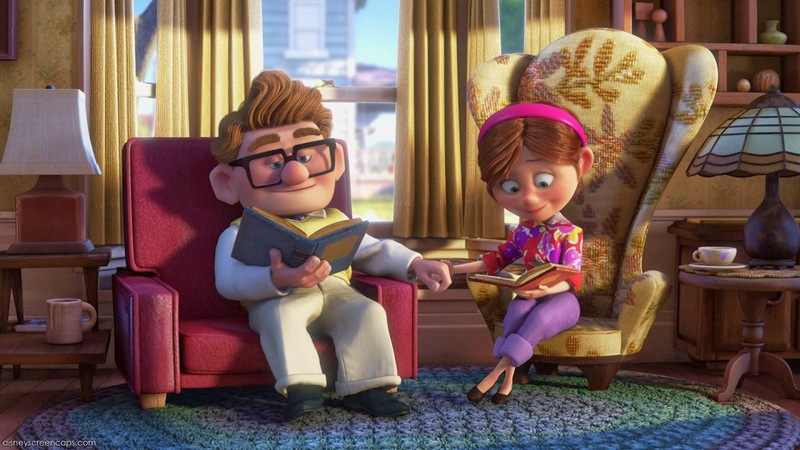 Carl and Ellie may have originated in a storyteller's mind, but their poignant, and, at times, heartbreaking experience exemplifies everlasting love. Amazon will be hearing from me tonight. There's a movie that has soared to the top of my must-see list. I have watched Up many times, I love it! Hey Kelly, I'm popping in from the weekend wander hop. I love the movie Up and I'm sure you will too! Make sure you have plenty of tissues on hand. Hi Monica, thank you so much for your visit. :-) It's been added to my must-see list. I may have to head over to Target to buy the movie. Thanks again. One of my favorite movies! I see my fiance and I in Carl and Ellie. Splendid! You will love it! And cry, and love it!